Regular Muni and Coker Muni rides! There will be options for both! You can fill out the form onscreen, then print it, and mail it to the address shown with your check. We will NOT reserve any campsites, and they will go fast! Please reserve a site early. Scott’s Valley Hilton. 10 double rooms reserved at $119. 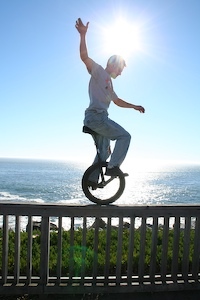 Say you are with the "mountain unicycle group" to get the discounted rate. Continental Inn - Santa Cruz. Note: rate update! Somewhat economical and close to town, but on a busier street (Ocean St). 2 Nights @ $95.00 per room, per night, one queen bed. Non smoking. Santa Cruz can be cool and foggy in the mornings, but it quickly warms up. Water/sports drink. For the Friday and Sunday rides I recommend a hydration pack with water, plus a bottle of sports drink. All of our 2007 trails are very remote, so you've got to bring everything you need. Money. The only meals included in the registration cost are Friday's pizza lunch, and Saturday's dinner. On Saturday night beer/alcohol must be purchased separately. You are responsible for all other meals. Warm clothes/layers. It can sometimes get cool in Santa Cruz. Unicycle(s). A good 24" muni will be great for most trails, although many people can keep up with a 20" trials uni. Bring your Coker or 36"er to go on the optional coker muni rides. Cell phone (optional). In addition, add in Corbin's phone number in case you have a question or are lost: 831-359-6178. It can get cool in the evenings, but the temperature in Santa Cruz is generally moderate. Just use Google Maps to find Santa Cruz. The individual rides will have directions for each of them.